Pope Francis’s Deeper Insight – Robert Fritz Inc. 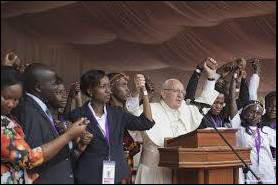 In Kenya last week, Pope Francis asked a stadium of young people to stand up and hold hands. A simple gesture. But the deeper message was about the destructive force of tribalism and the generative force of alignment with all of humanity. Historically, Kenya has had trouble with tribalism as recently as less than 10 years ago. But tribalism is not limited to the developing world. It is a world predicament. One of the biggest issues in our modern times is not terrorism as such, but the roots of it: tribalism. That word has a certain primitive connotation. We think of the jungle, and people with spears running around trying to protect their area in some tropical rain forest 10,000 years ago. But, in many ways and in spite of modern civilization, tribalism, called by other names, still plagues us. Some of the other names are nationalism, chauvinism, xenophobia, and intolerance. Not all nationalism is tribalism. There is a pride one can take in the unique cultural virtues of a country. French cuisine, American rock and jazz, German engineering, Japanese design, and so on. We can share in these wonders, even if we are not members of the country. In fact, the whole world benefits from the cultural richness of many countries’ unique gifts. But the ugly side of nationalism comes in the form of denouncing other groups who are not members of the nation (tribe.) A “we against them” mentality. The notion of one group’s superiority and another group’s inferiority. Issues of group identity have been with us since our earliest beginnings. Yet, the dilemma is that they are as powerful a force now as they have ever been. And this may be a flaw of the human psyche. Our basic nature is to collect around a group of similar people. We are social animals. We seek connection with others. On one level, with the globalization of technology, that could be a good thing. People can connect with others who are not in their immediate “tribe.” Differences enrich the larger sense of community, as people get to know each other and find that they have a lot in common. 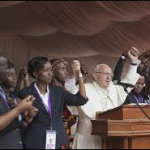 Unusual for a Pope, Pope Francis told his young gathering in Kenya to go on line, meet others through social media, connect with the broader world. He understands this as an antidote to radicalization. If the whole world joins together in friendship it is hard to become radicalized. Those who become radicalized have one thing in common. Individually, they feel insecure. They, by themselves, think they are nothing, or nothing special. They seek to bolster their identities by group membership. The leaders of cults and radical movements understand this well, and are very clever at offering something these individuals lack and desperately seek: glory, glamour, and praise. It is easy to grab a gun and kill innocent people as they go about their business. It is counter-instinctive and hard to die for such an event. The glory, the promise of a type of stardom, the rewards in heaven or paradise is compelling, but, by themselves, not enough to overcome the instincts of survival built into the human condition. There has to be another factor to compensate for the powerful dynamic of the survival instinct: that other groups are not only evil, but also threat to the survival of the tribe. It is easy to unite people when they have a common life-threatening enemy. To accomplish this, the enemy must be seen as an existential threat. It takes ignoring reality to buy the party line because human beings have more in common than differences. Culture, when transposed into identity, robs culture of its richness. Everything becomes symbolic. That means, reality is not seen or understood for what it is, but becomes a symbol for whatever is assigned to it. For some, it may be adopted in the name of religion, or politics, or ethnic origins. It will always be about identity and tribalism. In the West we often hear that we need to have a better message to counter the ones that Isis and al Qaeda have through their mastery of their propaganda machines. Given the nature of the messages, there is no counter message that can compete. You can’t fight one appeal to group identity with a different appeal to group identity. The basic premise of identity itself needs to be revealed as the charade it is. Freedom of the individual within the context of a healthy and productive community is a more sophisticated social structure. It is more complex to manage. It requires more than a tolerance of differences. It demands an appreciation of differences. It calls for the deep human desire to join together with others to build something we cannot do on our own. Such a structure brings out the best in everyone, not as some utopian ideal, but as a highly workable social order, which itself is an invention of humanity and well beyond a tribal mindset. And Pope Francis understands this well as he asks people of all nations, beliefs, ethnic groups, and cultures to join hands as an act of our common humanity.